The sphenoid bane (/ˈsfiːnɔɪd/; frae Greek sphenoeides, "wedgelike") is an unpaired bane o the neurocranium. 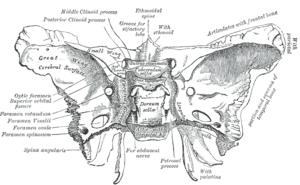 ↑ Entry "sphenoid" in Merriam-Webster Online Dictionary. This page wis last eeditit on 21 August 2014, at 23:37.